This article is about fiddle playing. For the instrument itself, see Violin. For the Indian film, see Fiddle (film). "Fiddler" redirects here. For other uses, see Fiddler (disambiguation). The medieval fiddle emerged in 10th-century Europe, deriving from the Byzantine lira (Greek: λύρα, Latin: lira, English: lyre), a bowed string instrument of the Byzantine Empire and ancestor of most European bowed instruments. The first recorded reference to the bowed lira was in the 9th century by the Persian geographer Ibn Khurradadhbih (d. 911); in his lexicographical discussion of instruments he cited the lira (lūrā) as a typical instrument of the Byzantines and equivalent to the rabāb played in the Islamic Empires. Lira spread widely westward to Europe; in the 11th and 12th centuries European writers use the terms fiddle and lira interchangeably when referring to bowed instruments. Over the centuries, Europe continued to have two distinct types of fiddles: one, relatively square-shaped, held in the arms, became known as the viola da braccio (arm viol) family and evolved into the violin; the other, with sloping shoulders and held between the knees, was the viola da gamba (leg viol) group. During the Renaissance the gambas were important and elegant instruments; they eventually lost ground to the louder (and originally less aristocratic) viola da braccio family. The etymology of fiddle is uncertain: the Germanic fiddle may derive from the same early Romance word as does violin, or it may be natively Germanic. The name appears to be related to Icelandic Fiðla and also Old English fiðele. A native Germanic ancestor of fiddle might even be the ancestor of the early Romance form of violin. In medieval times, fiddle also referred to a predecessor of today's violin. Like the violin, it tended to have four strings, but came in a variety of shapes and sizes. Another family of instruments that contributed to the development of the modern fiddle are the viols, which are held between the legs and played vertically, and have fretted fingerboards. In performance, a solo fiddler, or one or two with a group of other instrumentalists, is the norm, though twin fiddling is represented in some North American, Scandinavian, Scottish and Irish styles. Following the folk revivals of the second half of the 20th century, however, it has become common for less formal situations to find large groups of fiddlers playing together—see for example the Calgary Fiddlers, Swedish Spelmanslag folk-musician clubs, and the worldwide phenomenon of Irish sessions. Orchestral violins, on the other hand, are commonly grouped in sections, or "chairs". These contrasting traditions may be vestiges of historical performance settings: large concert halls where violins were played required more instruments, before electronic amplification, than did more intimate dance halls and houses that fiddlers played in. The difference was likely compounded by the different sounds expected of violin music and fiddle music. Historically, the majority of fiddle music was dance music, while violin music had either grown out of dance music or was something else entirely. Violin music came to value a smoothness that fiddling, with its dance-driven clear beat, did not always follow. In situations that required greater volume, a fiddler (as long as they kept the beat) could push their instrument harder than could a violinist. Various fiddle traditions have differing values. In the very late 20th century, a few artists have successfully attempted a reconstruction of the Scottish tradition of violin and "big fiddle," or cello. Notable recorded examples include Iain Fraser and Christine Hanson, Amelia Kaminski and Christine Hanson's Bonnie Lasses, Alasdair Fraser and Natalie Haas' Fire and Grace., and Tim Macdonald and Jeremy Ward's The Wilds. Hungarian, Slovenian, and Romanian fiddle players are often accompanied by a three-stringed variant of the viola—known as the kontra—and by double bass, with cimbalom and clarinet being less standard yet still common additions to a band. In Hungary, a three stringed viola variant with a flat bridge, called the kontra or háromhúros brácsa makes up part of a traditional rhythm section in Hungarian folk music. The flat bridge lets the musician play three-string chords. A three stringed double bass variant is also used. To a greater extent than classical violin playing, fiddle playing is characterized by a huge variety of ethnic or folk music traditions, each of which has its own distinctive sound. 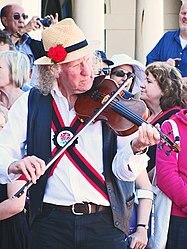 The Northumbrian fiddle style, which features "seconding", an improvised harmony part played by a second fiddler. Shetland fiddling, which includes trowie tunes said to come from peerie folk. The style is characterized by "ringing strings" and syncopated rhythms. A Lowland Scots tradition strongly influenced by baroque violin technique with staccato and Scotch snap bowing techniques in addition to the use of double stops. A Scottish Borders tradition with a repertoire heavy in hornpipes and with heavy use of double stops. A Highland tradition, highly influenced by the ornamentation and mixolydian scale of the Great Highland Bagpipe, as well as smoother bowing than other Scottish fiddle styles and a swinging of the 6/8 jig rhythm. An Orkney tradition with simpler bowing and ornamentation but with tunes featuring accidentals. Welsh fiddling (Welsh Ffidil; see Ar Log), a recently revived tradition. Donegal fiddling from the northwest in Ulster, which features mazurkas and a Scottish-influenced repertoire including Strathspey and Highland Fling dances. Fiddlers tend to play fast and make heavy use of staccato bowing and may from time to time "play the bass," meaning a second fiddler may play a melody an octave below where a first fiddler is playing it. Sligo fiddling from northern Connacht, which like Donegal fiddling tends to be fast, but with a bouncier feel to the bowing. Galway fiddling southern Connacht, which is slower than Sligo or Donegal traditions, with a heavier emphasis on ornamentation. Additionally, tunes are occasionally played in Eb or Bb to match the tonality of flat pipes. Clare fiddling from northern Munster, which tends to be played near the slower Galway tempo yet with a greater emphasis on the melody itself rather than ornamentation. Sliabh Luachra fiddling from the southwest in Munster, characterized by a unique repertoire of polkas and slides, the use of double stops and drones, as well as playing the melody in two octaves as in Donegal. Røros and Nord-Noreg styles, both using the standard fiddle. Finnskogen, using the standard fiddle, but featuring some flatted notes influenced by Finnish folk music. Voss and Telemark styles, both using the Hardanger fiddle. Setesdal, which uses both standard and Hardanger fiddles. Ostrobothnia, heavily influenced by Swedish fiddling. Tohono O'odham waila music, a style heavily influenced by Mexican fiddling and featuring irregular counts and harmonies in thirds, fourths, and sixths. Fiddling from Appalachia, the most well-known style today, featuring heavy use of droning and double-stops as well as syncopated bowing patterns. Athabaskan fiddling of the Interior Alaska. Midwestern fiddling, highly influenced by Scandinavian music. Ozarks fiddling, faster and crisper bowing than Appalachia. Texas fiddling, with influences from Mexican fiddling and an emphasis on competitive playing. New England fiddling, with strong influences from Québécois/French Canadian and British repertoires. Northwest fiddling, with influences from both Ozark and Midwestern fiddle styles, though with a strong emphasis on competitive playing like Texas fiddling. Fiddling remains popular in Canada, and the various homegrown styles of Canadian fiddling are seen as an important part of the country's cultural identity, as celebrated during the opening ceremony of the Vancouver 2010 Winter Olympics. French Canadian fiddling including "crooked tunes," that is, tunes with irregular beat patterns. Métis fiddling, of central and western Canada featuring strong French Canadian influence, but with even more "crooked" tunes. Stroh violin or phonofiddle, known in Romanian as Vioara cu goarnă. ^ Gyles, Mary Francis (January 1947). "Nero Fiddled While Rome Burned". The Classical Journal. 42 (4): 211–17. JSTOR 3291751. ^ Reiner, David; Anick, Peter (1989). Mel Bay's Old-Time Fiddling Across America. Mel Bay Publications, Inc. p. 37. ISBN 978-0-7866-5381-2. Double shuffle: syncopated string crossing on a chord, with the top note changing. ^ a b c d Harris, Rodger (2009). "Fiddling". okhistory.org. The Encyclopedia of Oklahoma History and Culture. Retrieved 2017-04-07. ^ a b "fiddle." Encyclopædia Britannica. 2009. Encyclopædia Britannica Online. 6 March 2009. ^ Anthony Baines: The Oxford Companion to Musical Instruments. Oxford University Press, USA (November 12, 1992). ^ Margaret J. Kartomi: On Concepts and Classifications of Musical Instruments. Chicago Studies in Ethnomusicology, University of Chicago Press, 1990 p. 124. ^ Encyclopædia Britannica (2009). stringed instrument. In Encyclopædia Britannica Online. Retrieved on 2009-03-14 from http://www.britannica.com/EBchecked/topic/569200/stringed-instrument. ^ "fiddle, n.". Oxford English Dictionary, 2nd ed. Oxford University Press. 1989. Retrieved 2008-03-28. (as access to the OED online is not free, the relevant excerpt is provided) "The ultimate origin is obscure. The [Teutonic] word bears a singular resemblance in sound to its [medieval Latin] synonym vitula, vidula, whence [Old French] viole, Pr. viula, and (by adoption from these [languages]) [Italian], [Spanish], [Portuguese] viola: see [viol]. The supposition that the early [Romance] vidula was adopted independently in more than one [Teutonic language] would account adequately for all the [Teutonic] forms; on the other hand, *fiÞulôn- may be an [Old Teutonic] word of native etymology, although no satisfactory [Teutonic] derivation has been found." ^ "Bosworth and Toller". Web.ff.cuni.cz. Retrieved 2012-04-30. ^ Mario Pei, The Story of the English Language (New York: Simon and Schuster, 1967), p. 109. ^ Weinfield, Author: Elizabeth. "The Viol | Essay | Heilbrunn Timeline of Art History | The Metropolitan Museum of Art". The Met’s Heilbrunn Timeline of Art History. Retrieved 2018-04-09. ^ Webster, Andy (16 March 2012). "Traditional Irish Music in New York City". The New York Times. Retrieved 6 February 2018. ^ "Amelia Kaminski Productions". Willockandsaxgallery.com. Archived from the original on 2011-11-12. Retrieved 2011-11-14. ^ "Fire & Grace". Culburnie.com. Retrieved 2011-11-14. ^ "The Wilds". Tim Macdonald and Jeremy Ward. 2017-11-15. Retrieved 2018-08-24. ^ Joseph Lyons. "Scottish Fiddle Music". Scotlandsmusic.com. Archived from the original on 2012-04-19. Retrieved 2012-04-30. ^ "Regional Irish Fiddle Styles". Irishfiddle.com. Archived from the original on 2012-04-23. Retrieved 2012-04-30. ^ "Middle Eastern and Mediterranean Fiddle". Fiddlingaround.co.uk. Retrieved 2011-11-14. ^ "Klezmer Fiddle". Fiddlingaround.co.uk. Retrieved 2011-11-14. ^ "East European and Gypsy Fiddle". Fiddlingaround.co.uk. Retrieved 2011-11-14. ^ "Gu-Achi Fiddlers - Old Time O'odham Fiddle Music (CR-8082)". Store.canyonrecords.com. Archived from the original on 2012-08-03. Retrieved 2012-08-03. ^ "Western Swing Fiddle". Fiddlingaround.co.uk. Retrieved 2011-11-14. ^ "Jackson School of International Studies - Canadian Studies Center". Jsis.washington.edu. Archived from the original on 2013-10-23. Retrieved 2012-08-03. The Fiddle Book, by Marion Thede, (1970), Oak Publications. ISBN 0-8256-0145-2. The Fiddler's Fakebook, by David Brody, (1983), Oak Publications. US ISBN 0-8256-0238-6; UK ISBN 0-7119-0309-3. Oldtime Fiddling Across America, by David Reiner and Peter Anick (1989), Mel Bay Publications. ISBN 0-87166-766-5. Has transcriptions (standard notation) and analysis of tunes from multiple regional and ethnic styles. Violoneux.fr, background information on fiddlers of different French regions in the nineteenth and early twentieth century. In French.